Loveland Pass is a high mountain pass in the Colorado Rockies on the Continental Divide. Loveland Pass Summit is located on U.S. Highway 6, approximately 10 miles east of the town of Dillon, Colorado. U.S. Highway 6 is the original central route across the state of Colorado, which was subsequently replaced by Interstate 70 and the Eisenhower/Johnson Tunnels. Over-height trucks and trucks carrying hazardous materials are not allowed in the tunnels and must use the old Loveland Pass to bypass the tunnels. 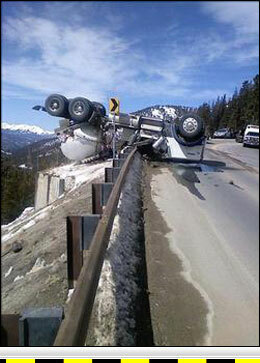 There is a large amount of fuel tanker traffic on Loveland Pass and the pass is notorious for fiery tanker rollover crashes. U. S. Highway 6 on both sides of Loveland Summit is a classic steep winding mountain shelf road. The summit of Loveland Pass is nearly 12,000 feet in elevation and the pass is reportedly the highest mountain pass in the world that stays open during the winter. The pass is commonly used for back-country car shuttle skiing, so skiers are commonly encountered on the pass road, hitchhiking or waiting for a ride back to the summit. Loveland Pass receives a large amount of snow in the winter, and often either has chain restrictions for commercial trucks or is closed for avalanche control. 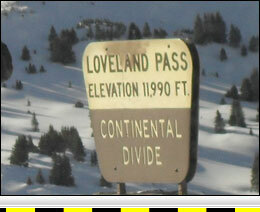 Westbound U.S. 6 from the Loveland Summit has a vertical descent of 2,582 feet over a distance of 8.4 miles. The grade has a steady, steep descent for this distance before flattening to a gradual descent continuing into the town of Dillon, where the highway intersects with I-70. The descent has numerous advisory speed curves, the lowest having an advisory speed of 20 mph, at 1.3 miles west of the summit and a second 20-mph curve at 2.5 miles west of the summit. A highway department maintenance facility is about 3.1 miles from the summit, where highway maintenance trucks entering and leaving the driveway should be expected. Arapahoe Basin Ski Area is located approximately 3.6 miles west of the summit and has numerous parking areas on both sides of the road. Additionally, 8.2 miles west of the summit is the Keystone Ski Area. Entering traffic should be expected at these locations, particularly in the morning and afternoon from the October to June ski season. After passing the Keystone Ski Area, U.S. Highway 6 continues into the town of Dillon, where numerous intersections and traffic signals will likely require stops. Eastbound U.S. 6 from the Loveland Summit has a vertical descent of 1,287 feet over a distance of 4.3 miles. The descent is steady and steep, with numerous advisory speed curves, the lowest being a 20-mph curve at 1.2 miles east of the summit. Loveland Ski Area is located on the eastside of the pass near the base, with parking lot entrances on both sides of the highway from 3.6 miles to 4.7 miles east of the summit. The grade flattens at approximately 4.3 miles east of the summit just before reaching its intersection with I-70 at about 4.7 miles east of the summit. U.S. Highway 6 intersects with I-70 by way of an entrance ramp where merging onto I-70 is required. Additionally, a traffic metering signal at the entrance to I-70 may require a stop. 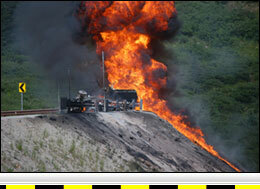 After merging onto I-70, a steep downgrade should be expected for approximately the next 11 miles. is crowded with skiers and site seeing traffic.